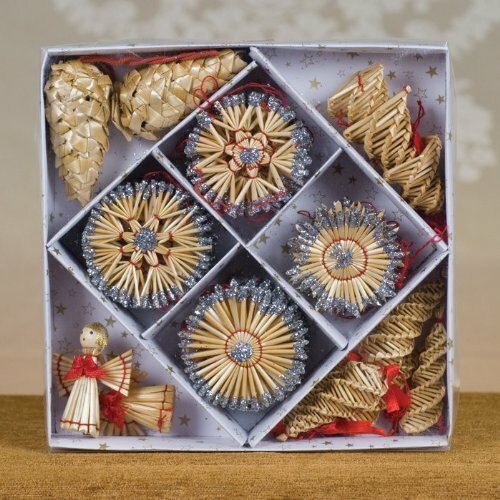 Give your Christmas tree a timeless look with traditional wooden and straw ornaments. Christmas has lots of timeless traditions. Many of these are about seasonal decorations. Using traditional wooden and straw ornaments bring this tradition into your home for the season. It helps take you back to the core of Christmas. Into the symbolism of the time. Christmas tree decorations are an age old custom that has been passed down through the centuries. Natural materials have always been a part of this tradition. Apples, pomegranates, dried orange slices, nuts (especially hazelnuts and walnuts) and pine cones were some of the common ornaments used in earlier times. The use of straw for religious reasons also dates back to ancient days. This means by using wooden and straw ornaments to decorate your Christmas tree you're bringing your family closer to the origins of Christmas. There are many holy trees connected to Christmas celebrations. These include fir, spruce, pine, yew and mountain ash trees. These are the traditional tree types that have been used as Christmas trees. This means ornaments made from their wood is also connected to this season. Yet many wooden Christmas ornaments are made out of olive tree wood. This is because the olive tree is strongly associated with many biblical stories. The dove Noah released from the ark gave news of dry land by bringing a small olive branch back to the ark. It has important connections to the life of Jesus too. Bethlehem is known for it's olive trees. It's also the symbol of peace. 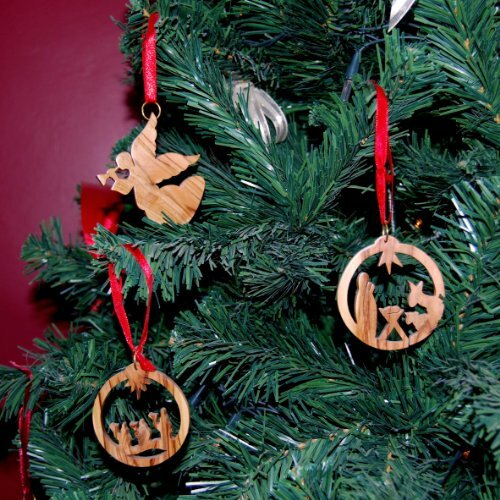 This means many religious themed ornaments are made out of olive wood. Probably because it connects this biblical and peaceful symbolism to the tradition of decorating for the season. 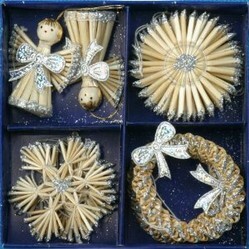 If you're not looking for classic religious ornaments have a look for decorations made in wood other than olive. Walnut is a good example. Walnut was thought to be a holy tree in ancient times. Walnuts were a symbol of fertility thus were also related to the symbol of birth. More importantly though walnut was considered to be a symbol of immortality. So it's not surprising walnut is one of the woods used for Christmas tree ornaments. You don't see many nativity or other typically Christian designs made in walnut wood, probably because walnut isn't linked to Bethlehem or the bible. 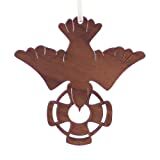 Instead the designs for walnut decorations are created in other traditional symbols of Christmas. The bauble is a symbol of Christmas that's very traditional. The original Christmas tree balls or baubles were hung to reflect the bright flame of candles (another traditional symbol of the season.) They were also meant to bring luck, wealth and success to the home. The symbol of the dove represents peace - and it's one of the common birds connected to Christmas. Often being used for designs on Christmas cards. You can find other symbols of Christmas in this wood too. Amazon has a nice selection if you're wanting matching walnut wood ornaments for your tree. 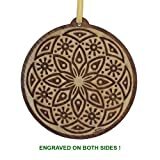 CHRISTMAS WOOD ORNAMENT NAME PERSONALIZED "HANDMADE"
Straw is a natural material that has ancient links to spiritual beliefs. Yet it didn't become a popular material for Christmas tree ornaments until the 1950s. Even though the use of straw in making Christmas tree ornaments doesn't have the history of wood, it still has a strong link to traditional practices. Straw fits into the old ways of using natural materials for decoration. It just took some time for this material to be made into shapes that we know as symbols of Christmas. Even thought they're not as old, straw ornaments still have that classic Christmas look about them just like the wooden ornaments. But they also have a fragility and daintiness the wooden ornaments don't have. There's an ethereal look about them. This means a Christmas tree decorated with straw will have a totally different feel and character to a tree decorated with wood. So to enhance this look it's best if things like thin threads of silver tinsel, small red baubles or small wooden ornaments are mixed with the straw ornaments. Using these types of ornaments will bring out the ethereal and dainty look of your tree. I really like the natural look of these ornaments! What a nice article! I never thought much about wood essences in relation to the Christmas tree. Also liked your comments about the balls being there to reflect candlelight -- how wonderful it must have looked.